A trip to Tokushima wouldn’t be complete without viewing the Naruto Whirlpools. We will introduce you to the restaurants, accomodation options and sightseeing spots near the Naruto Whirlpools. In part 1, let’s explore the Naruto Whirlpools. The whirlpool phenomenon occurs in the flow of opposing tides that happens in the Naruto Strait. The size of a whirlpool can be as big as 20m in diameter. There are both large and small whirlpools. They form, then disappear, and then form again. The current in the Naruto Straight is the fastest in Japan. It is as fast as the Strait of Messina in Italy, and the Seymour Narrows in Canada, which is one of the three greatest straits in the world. Whirlpools occur at certain times. This information will be listed on the homepage, so it is recommended to check before you go. How to See the Whirlpools? There are two ways to look at the whirlpools. The first way is to see the whirlpools up close from a Pleasure Boat. Small and large sized boats travel near the whirlpools, so you can experience the flow of the sea and the dynamic tide. Another way is to walk on the Ōnaruto Bridge Promenade / Path of the Whirlpool. 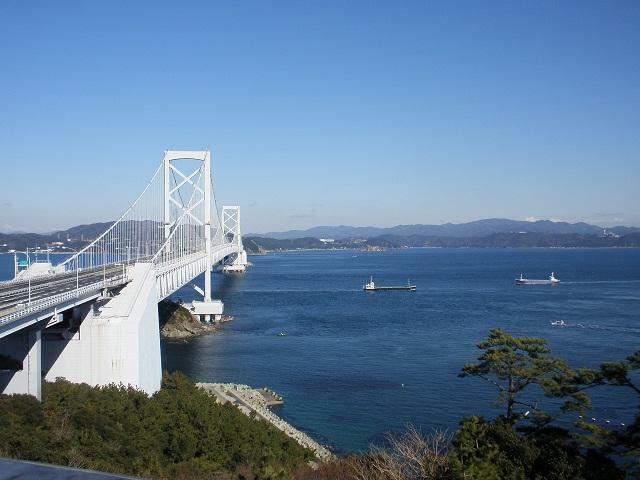 This bridge goes from Awaji Island to Tokushima. The glass floor allows you to see the whirlpools as you walk there. There is an observatory right above the whirlpools, which uses the space of a large girder on Ōnaruto Bridge. It allows visitors to see the whirlpools up close. The large whirlpools are particularly impressive. There is also a panoramic rooftop observatory nearby, where you can enjoy a 360 degrees view of Naruto Strait and Ōnaruto Bridge. In addition, you can learn interesting facts about whirlpools. There is also a playing area for children, where they can experience virtual fishing. Naruto Strait is also famous for fishing! The whole family can enjoy this place! In the second part of this article, we will introduce you to some gourmet restaurants and accomodation options near the Naruto Whirlpools. Don’t miss it!